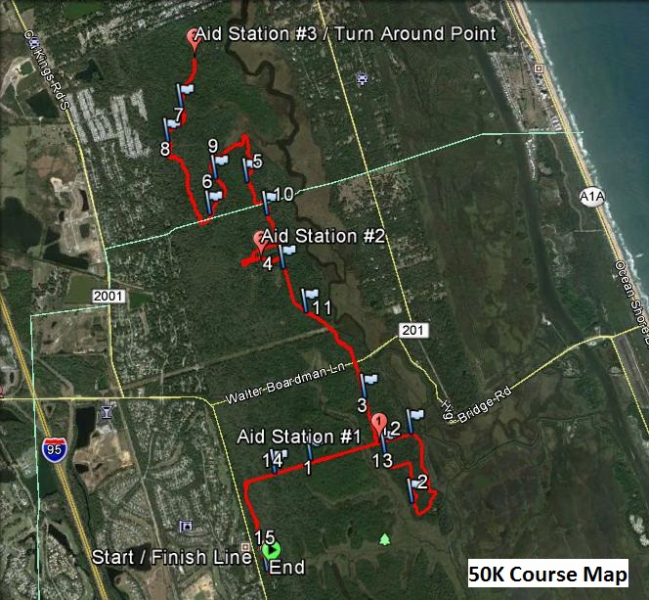 Register for the Bulow Woods Trail Race and Ultra Marathon today! "Go Off Road for a Rum"
A portion of the race proceeds will go to the Friends of Tomoka Basin State Parks to help maintain the trails and promote the Bulow Woods heritage. Run? I thought they said Rum! Well, you are right, we did say Rum. Finishers of all events will receive a custom race t-shirt as well as a commemorative glass -- which we will gladly fill with a tasty beverage, our own special mix of "Rum Runner", at our post race party! In addition all finishers will receive custom finisher's medals. The post race party and awards ceremonies will offer complimentary food, drinks and music for all to enjoy. Camping is available at Tomoka State Park by joining other race participants in the Group Camping Area, or by reserving your private spot through reserveamerica.com. Race Day at the start / finish line of Fairchild Oak, 3351 Old Dixie Highway, Ormond Beach, Florida 32174, starting at 6:00 AM. Please note that there is NO RUNNERS PARKING at the start/finish area. See the Parking section above for details. All runners may leave a drop bag at the start/finish area. Parking for this event will be at Tomoka State Park, 2099 North Beach Street, Ormond Beach, FL 32174. Runners will be shuttled from the parking area to the start line of the event and back again upon completion of their race. The shuttles will start running at 5:45 AM and continue until the last runners finish the event. Please plan to arrive at least 45 minutes early to ensure you have time to get on the shuttle to the start line. The shuttle will make continuous trips approximately every 15-20 minutes. Please allow plenty of time to arrive for your event. If you wish to drop your runner off, you can drop them off at the entrance to the Bulow Creek and Fairchild Oak Park, 3351 Old Dixie Highway, Ormond Beach, Florida 32174. This is only for runner drop off and pick up. There will be no parking available at this location. All runners may leave drop bag at the start/finish area. The post race party and awards ceremony will be held at the start / finish line area. There you will receive your custom commemorative glass and free drinks and food. Join us for the post race party, celebrate with your fellow runners and cheer on the other runners as they finish their race. Awards will be given for Overall Male and Female, Masters Male and Female and top 10 Male and Female for each distance. Times for the awards ceremonies are approximate and dependant on the number of finishers for each event. The 50K course will consist of two laps on the out and back course. Each lap is just over 15 miles. There will be 3 aid stations along the route that you will pass multiple times. Each aid station will have a wide variety of snacks and food as well as water and Gatorade electrolyte drink. Each aid station will also have at least 1 porto john. You will have the option to have a drop bag taken out to the turn around point of the course and you may also leave a bag at the start/finish area which is your half way point. 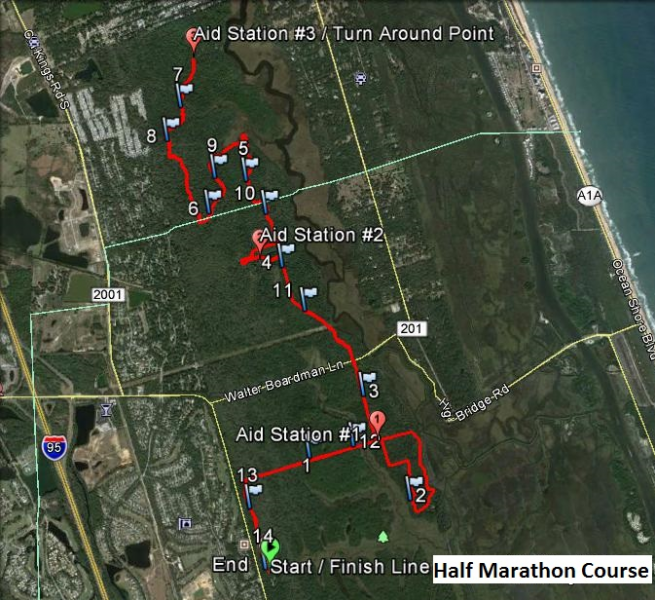 The Half Marathon course will consist of one lap on the out and back course. The course is approximately 13.6 miles, so you get about a half mile bonus. There will be 3 aid stations along the route that you will pass multiple times. Each aid station will have a wide variety of snacks and food as well as water and Gatorade electrolyte drink. Each aid station will also have at least 1 porto john. 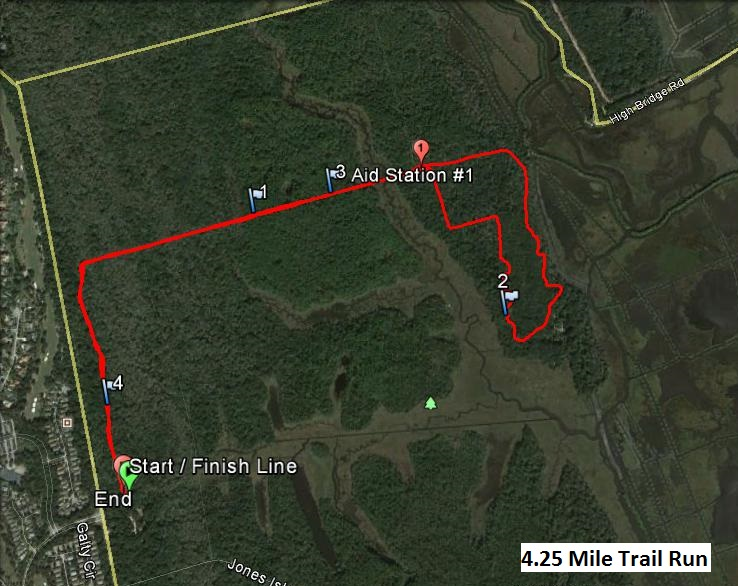 The 4.25 mile trail run course will consist of one lap on the out and back course around the red loop of the Bulow Creek Trail. This lap is approximately 4.25 miles long. There will be 1 aid stations along the route that you will pass twice. The aid station will have a wide variety of snacks and food as well as water and Gatorade electrolyte drink, and 1 porto john. There will be 3 aid stations out on the course. Each aid station will be well stocked with a wide variety of snacks as well as with water and Gatorade electrolyte drink. 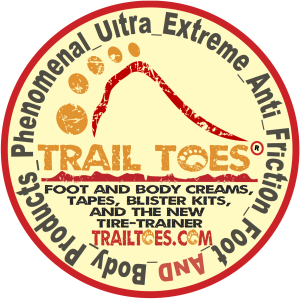 Depending on which distance you are running you will pass the aid stations multiple times. Aid stations are located every 1.1 - 3 miles apart. All runners may leave a drop bag at the start/finish area. 50K runners may access this bag at the half way point of their race. 50K runners may also have a drop bag taken out onto the course for access during the race. These will be placed at the Turn Around point/ Aide Station 3 which is at approximately mile 7 of the out and back course. 50K runners will pass this point twice. Bags must be delivered to the drop bag area by 7:00. If you have a bag taken to the turn around point, you will be responsible for telling the aid station staff when you are done with your bag and ready for it to be returned to the start / finish line. We will do our best to return bags in a timely manner, but please be patient. No drop bag returns are guaranteed until the end of the event. This YouTube video shows a preview of the Bulow Woods Trail. Follow these links to view our Flickr page and the photos from past events.